Nanotechnology has immense potential. Our future computing hardware could be radically transformed. Virtually indestructible, solar cell covered smartphone cases. Vivid, flexible, low-energy displays. Blazingly fast memory, processors and graphics. Cheap bio-sensors and personal tricorders. 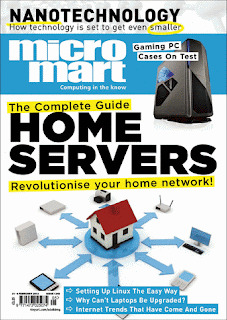 Find out more in my six page feature Micro Mart magazine article in issue 1245 - out now. One of the primary reasons nanoparticles are so interesting is they exhibit quite different properties and capabilities compared to the very same material in bulk form. Just as predicted by the visionary scientist Richard Feynman in his famous 1959 lecture 'There's Plenty of Room at the Bottom'. Carbon nanotubes are strong and resilient, with an ability to 'spring' back to their original shape after bending. And it's possible to fabricate multi-walled nanotubes for even greater strength and resilience. Adding nanotubes to composite materials will significantly increase their strength-to-weight ratio. A tactic that's frequently employed by organisations like NASA, the military and F1 racing teams. Unlike the previous OLED components nanowires exhibit an ability to flex while continuing to operate. If the nanowires are deposited onto plastic sheets the whole display will be able to bend. Flexible displays would be a revolutionary technology for gadget designers, who could envisage all kinds of novel and innovative scenarios. Foldable e-readers, bendy iPads and screens that wrapped around your wrist are just some of the possibilities. And flexible devices will be far less likely to suffer damage after a heavy impact or drop. Head over to the Micro Mart website or my own author page to find a collection of past articles.